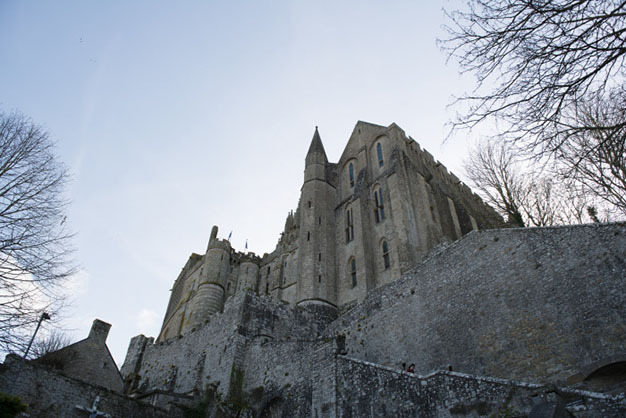 Succeeding the previous buildings, of which only the church ofNotre-Dame-Sous-Terre still survives, a Romanesque abbey was built on the Mount in the 11th century. Based on a Latin cross design, the Abbey church is supported by an 80m long artificial platform. Although the transept crossing is on the tip of the rock, the arms of the transept and the chancel are supported by crypts, while the nave is built on top of the old pre-Romanesque church. 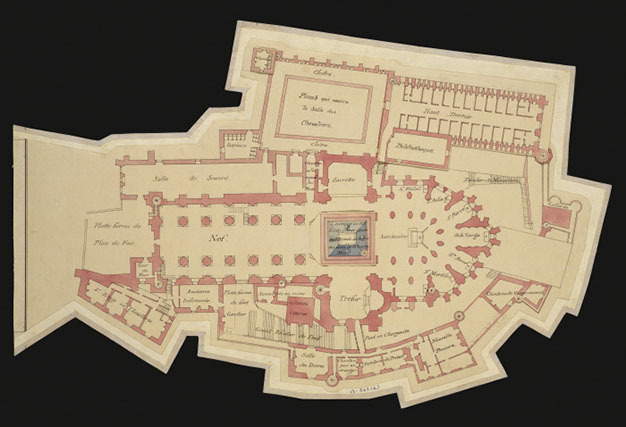 "Plan of Mont-Saint-Michel Abbey and Château 1776"
This construction has undergone numerous changes, following collapses, fires, successive refurbishments and restorations. 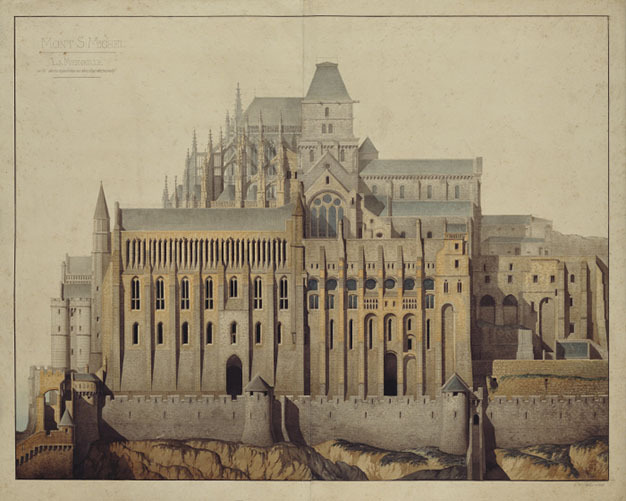 Today, the Abbey forms a uniform, composite whole, a blend of different periods and styles. As its name indicates, the "Merveille" (marvel) building is the undisputed masterpiece of the Abbey. Its construction dates back to the early 13th century, representing a genuine technical and artistic feat. The 13th century was a time of great intellectual, artistic and economic activity, resulting in many major building programmes all over the Western world. From 1204, Normandy was attached to the Kingdom of France, and therefore benefited from the attention and protection of the Kings of France. The Merveille was built during this period, on the Northern side of the rock. The Merveille is a splendid illustration of the spirit of Gothic art that was popular throughout Western Europe at this time. Its bold architecture consists of 3 layered levels, culminating in a height of 35m, supported by sixteen powerful buttresses. "Mont St Michel, la Merveille et ses dépendances dans leur état primitif"
The construction work lasted for 17 years, under four successive abbots. Each floor was organised according to different functions, either public or monastic. On the ground floor, the cellar for storing food and the chaplaincy for welcoming pilgrims; on the second floor, the dining hall with its imposing fireplaces, reserved for special guests, and the so-called "knights" room, the former scriptorium. 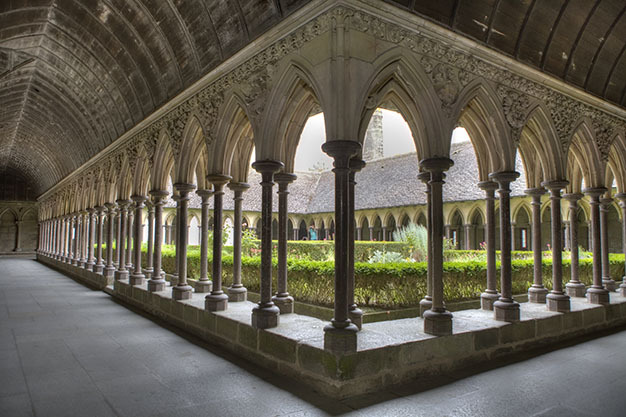 The final level contained the cloisters and the monks' refectory. The "knights" room was also called the scriptorium. For a long time the scriptorium was thought to have been the place where manuscripts were produced and illuminated. However, it would seem that it was in fact used for reading and studying. From the 14th century onwards, the Mount was transformed into a fortress: the village was surrounded by ramparts and defended by several towers. The entrance to the Abbey was commanded by a real gatehouse, the passageway that visitors still use today. Over the centuries that followed, collapses and fires resulted in a number of reconstructions. In 1421, the Romanesque chancel of the church collapsed, and was rebuilt in the 15th century in a flamboyant Gothic style. In 1622, a new Benedictine community was established on the Mount, the Congregation of Saint-Maur. 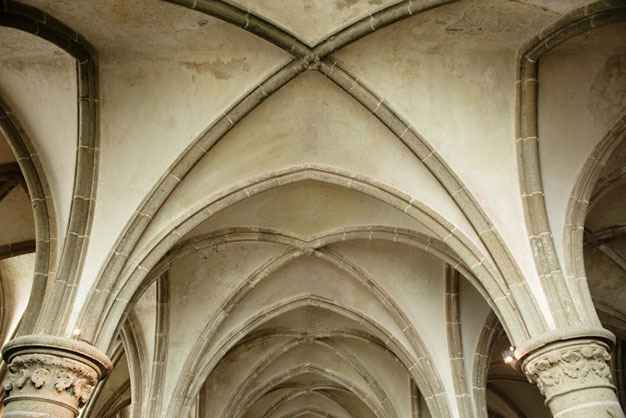 The Maurist monks undertook a number of redevelopments in the Abbey, the most surprising of which was the division of the large Gothic refectory into three levels, to make a series of cells. In 1776, following a fire, the first three bays of the nave were destroyed. To close off the shortened nave, a new facade was built in the classical style.